Jenrry and Jerry and Ducks. So the New York Metropolitans have decided that 20-year-old Mariano Rivera — oh sorry. I mixed them up again — The Mets have decided that 20-year-old Jenrry Mejia will pitch as a reliever for the rest of spring training. Mejia, who by the way has thrown a total of 44.1 innings above the single-A level, is presumably auditioning for a chance to break camp with the big league squad in a bullpen role. This decision makes perfect sense. Wait, hear me out. I’ll admit that with more time to simmer, Jenrry Mejia could turn into a front-of-the-rotation starter throwing 200 innings a year — and a starter throwing 200 innings is far more valuable than a reliever throwing 80. As awesome as Jonathan Pabelbon is, Zack Greinke does far, far more for his team, solely because Greinke throws more innings. Greinke was a 9.4 WAR pitcher in 2009; Pabelbon was 1.9 WAR. Mike Pelfrey was valued at 1.8 WAR, and he was awful — but still, just about as valuable as Jonathan Pabelbon. Good starters are vastly, vastly more valuable than good relievers. So I’ll admit that. And I’ll grant that sticking Mejia in the bullpen now probably stunts his development, and it could destroy his confidence if things go sour. If the Mets are desperate to have Mejia see some big league action this year, it’s probably better to let Mejia throw a normal amount of minor league innings, work on some stuff, and then come up in September and mystify hitters for a month, like the Rays did with David Price and the Yankees with Joba Chamberlain. The batters won’t have enough time to figure Mejia out in just a month, and he gets to feel good about himself. I struck out Jorge Cantu in a meaningless game! Cool! Maybe he can work out a handshake with Johan Santana. * But sticking him in the bullpen right from the outset of the season may give hitters too much time to figure out an underdeveloped pitcher, and eventually expose him. Which would be bad for a 20-year-old. So I’ll give you that, too. 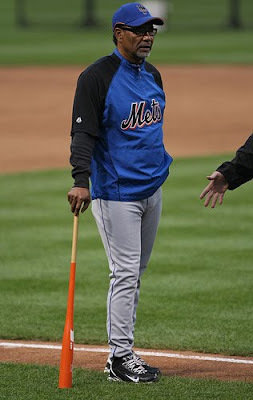 */wishes he could make up handshake with Johan Santana and strike out Jorge Cantu. Sighs and continues to write about baseball from mother’s basement. While wearing XXXX-L “Han shot first” – he did! – shirt, of course. I’ll even cop that helping the middling 2010 Mets win a couple of games is far less important than helping the 2011-and-onward Mets win games. The 2010 Mets may not be particularly good, and the Braves and Phillies are likely much better. Adding 1-2 wins to the 2010 Mets may not matter much. But leaving Mejia in the minors won’t help the 2010 Mets win more games in April and May. That’s why bringing him up now makes sense. Because April and May are really, really important. That is, it all makes sense if you’re Jerry Manuel. Go ahead, try it out. Pretend you’re Jerry Manuel for a minute. First, completely wipe your memory of Nick Evans. Now, throw on some thick-rimmed glasses. Go to the library and pick up a couple of biographies about famous leaders — maybe Lincoln, Gandhi, MLK, Rodney Dangerfield. Practice chuckling heartily at one of your own jokes. Deep, full belly laughs, now — you’ll need to dodge saying anything meaningful by deflecting with humor and distracting laughs. Now trying saying a few crazy things, like you have no filter: “I feel Mike Jacobs could do some good things for us. Real good things.” Feel an inexplicable burning hatred for that soft dog, Ryan Church. Really feel the hate flow through you — but keep chuckling heartily. Remember: comedy first, team second. A.) Argue that the young flame-throwing right-hander Mejia needs to develop in the minor leagues so that he will be better suited to contribute to future Met teams. Mets teams you likely will not be managing. B.) Fight like all hell to have this kid baffle major league hitters for a month in April, maybe help win a few more close games, and preserve your job in the process. Just think what that could mean: more time to tell jokes! Now normally, on most teams, there exists a check-and-balance system to keep lame-duck managers from making lame-duck decisions. Lame-duck decisions like this one. Someone in the Mets organization should be using their better judgment to take Jerry’s shiny new toy away, because he might break it on his way out the door. Someone needs to say that Jenrry Mejia should start in the AA rotation because that’s a better decision for the future of the franchise. That someone should be Omar Minaya, who is the general manager. You know, the one with full autonomy and stuff. Except Omar Minaya is also fighting for his job this season. Meaning he is also a lame-duck, prone to making lame-duck decisions. His seat may not be quite as hot as Jerry’s, but it’s probably uncomfortably warm. So the two people making decisions about the 2010 Mets roster may be far more concerned with April 2010, than 2011 and beyond. So while you and I and other Met fans can look at Jenrry Mejia being turned into a reliever before our eyes and scream: “NO! WHY CAN’T YOU SEE WHY THIS IS A BAD IDEA! HE’S NOT GOING TO THROW ENOUGH INNINGS THIS YEAR! HE’S NOT GOING TO LEARN TO CONTROL HIS SECONDARY PITCHES! WHAT ARE YOU DOING? STOP LETTING JERRY DO WEIRD THINGS!”, the Mets brass can’t or won’t. 2011 and beyond is in our vested interest, so we see these things and care about them. But 2011 is not necessarily in Jerry Manuel and Omar Minaya’s vested interest. They may not be here next year, or even next month. They’re not idiots, they see the future — but it’s just not as important to them as “not getting fired.” And a decision that is painfully and obviously shortsighted is being “okay’d” up and down the Mets decision making ladder. In a way, this Jenrry Mejia thing makes a lot of sense. Even if it really doesn’t make any sense.